Most of the dogs and cats love walking around the neighborhood. However, as they grow older, they experience muscle and joint problems that decrease their energy. They are not as spiky and energetic as they used to before. If they limp while walking, it’s a sign that walking can cause them pain. As a pet owner, do not let the joint pain take away your dog’s happiness. You can invest in a quality pet stroller instead. It helps to minimize the stress of your dog while you’re walking around. Your pet can still enjoy the surroundings and visit his favorite places to play without exerting much effort. 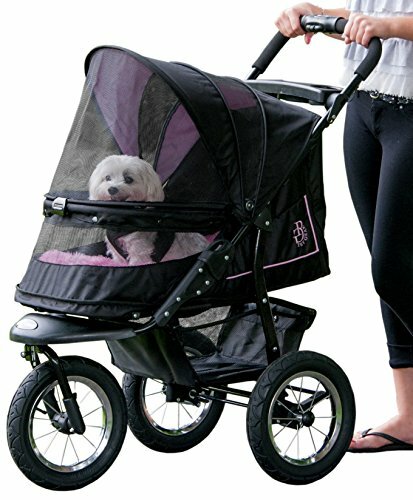 A pet stroller also allows you to bring your dog wherever you go, be it the shopping mall or supermarket. Allow us to be your guide in choosing the best stroller for your dog. We have rounded up the top ten best pet strollers that can guarantee the safety of your furry friend during your regular walks. From durability to comfort it can provide, below are the best models of pet strollers to buy. This model will allow you to walk your dog around the neighborhood without the hassle of zipping the entry in and out. Its easy locking mechanism provides comfort to the pet owners while on the go. You need not struggle with the zippers anymore. It also features a bolster pad to provide maximum support for your dog. Its 12-inch air ride tires are suitable for any pet parent’s height. This design is fit for large dogs who had been in surgery and had limited mobility. Your dog can look outside through the mesh using its front bar as support. Thanks to this product, jogging with your senior or ill dog is easier. Guardian Gear is reputable for manufacturing quality and affordable pet strollers. This model is no exception to their great products. Now you can take your dog or cat for a walk using this sporty pet stroller. Its set of wheels are made of polymer, metal, and plastic to give you a smoother ride. You can secure your pet inside using its mesh while giving them the entire panoramic view of the place while walking. There is a large zipper opening for easy access and a removable inner pad to clean it quickly. 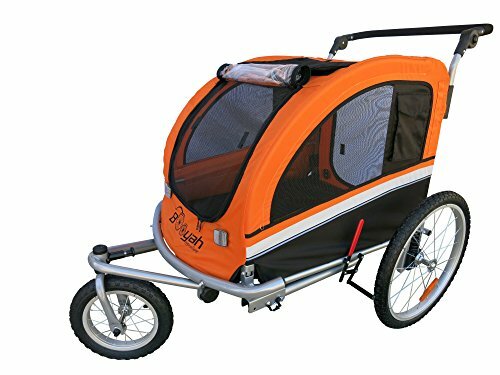 The package includes two securing lock clips, a plastic cup holder, padded handlebars, and lower-level storage for maximum comfort of both pet and its owner. This pet stroller is designed for a small breed of dogs and cats weighing up to 25 pounds. Introducing this all-new pet stroller from Gen7Pets. It’s both stylish and functional for morning walks with your pets. There are several aesthetic designs you can choose from. Its lightweight aluminum frame allows you to travel with this stroller. It features three shock-absorbing wheels, so no bumpy ride for your cats or dogs. The Smart-Canopy folds under the canopy hood to provide huge space for your pet. It also features a smart-reach handle allows you to have the freedom of motion while walking. Since the smart-wheels are made of EVA foam, you need not pump air anymore. This model can accommodate pets weighing up to 60 pounds. The extra seat pad ensures that your pet is comfortable inside the stroller. Can’t seem to find the right stroller for your big buddy? 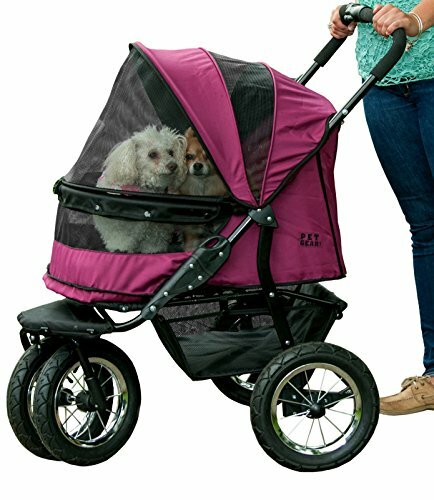 Check out this pet stroller from Pet Gear. Designed for a large breed of dogs, the top has an opening for their heads. Its large compartment can accommodate multiple small dogs at once or one large furry friend of yours. The No-Zip technology provides convenience to the pet owner in the long run. You only need to push the button entry, and it will lock and unlock by itself. This pet stroller is ideal for dogs who just went on a surgery thanks to its dual entry that provides easy access. You can also leave the cover up for your dog to enter using the front with the cover open. The interior line is removable, making it easier for you to clean it. Now you need not limit your ill dog from walking thanks to this pet stroller. 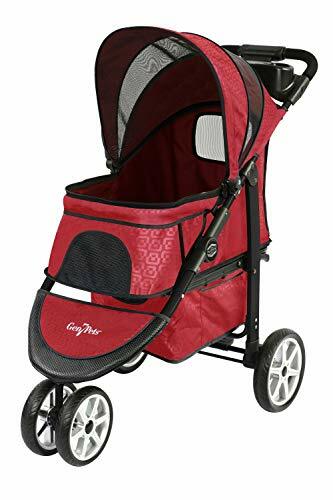 Available in red, black, and grey, this pet stroller from DoggyRide is both stylish and durable. Its lightweight aluminum frame allows you to tuck it on the trunk of your car quickly. You bring it anywhere for traveling with your dog. The pet stroller features quick release wheels for maximum convenience. It also has a padded front headrest for injured and ill dogs and additional front reflective spring. If you love jogging with your dog, its central wheel aligner allows you to be always on the go. You can ensure the safety and comfort of your dog thanks to its secured design. The item is pre-assembled, so you only have to spend a few minutes to attach the last few parts, and it’s ready to use. 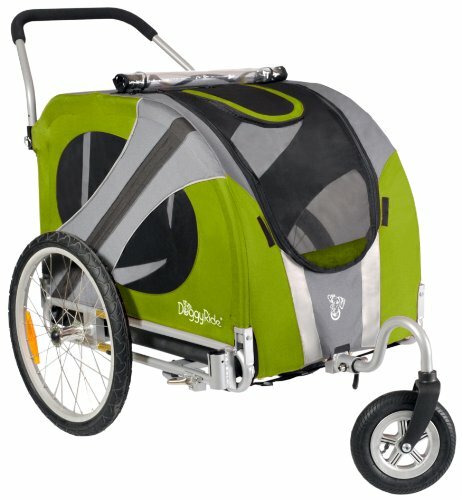 Another product from DoggyRide is this lightweight and stylish pet stroller. Stainless spokes and hubs show its solid construction that can accommodate large dogs. Its quick release wheels also allow you to place your dog with little hassle. The padded front headrest and additional front reflective spring provide extra comfort for your bus while inside the stroller. For your belonging, there is a large rear pocket that can secure valuable items. The vented windows also provide maximum airflow to your dog while securing him inside. The item is pre-assembled upon arrival. For pet parents who love being extra and trendy with their pets, check out this pet stroller from Booyah Strollers. In stylish green and black color, it features a manual break. You need not rely on the rear brake anymore thanks to its convenient and safety hand brake. 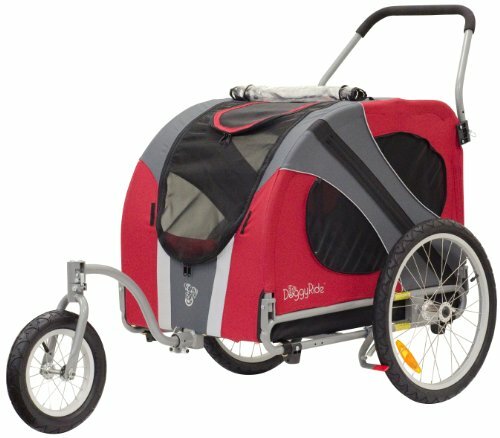 This can serve both as a stroller and bicycle trailer for dogs weighing up to 88 pounds. The zippered rear and front entrance provide easy access. You can still offer the panoramic view for your dog thanks to its velcroed, mesh, and open sunroof. The wheels are set back for you to avoid the “tipping” effect. Trailer arms swing underneath. 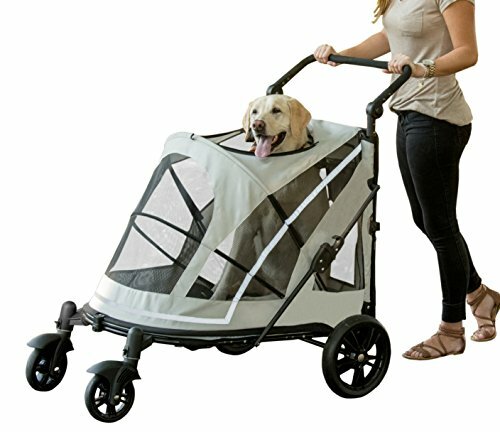 This is the perfect stroller for regular walks with your dog if he has arthritis or any joint problems. 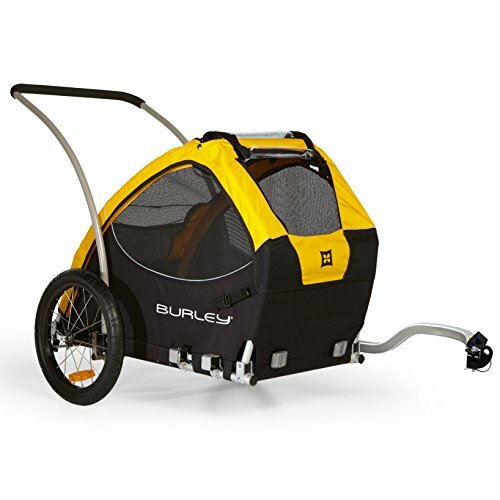 The Burley Tail Wagon pet stroller features a removable floor for easy cleaning maintenance. It also has optional securing tie downs. It has side battens for maximum stability and flip-down tailgate for easy loading and unloading of your pet. This pet stroller has a generous interior that can accommodate dogs weighing up to 75 pounds. Its all-weather cover with waterproof zippers and heavy-duty mesh cover on four sides provides maximum airflow to your dog. This pet stroller is leash-friendly. You can loop the leash through rings on the side or front in securing your pet. It also offers cargo pockets for storage of your belongings while walking your dog. 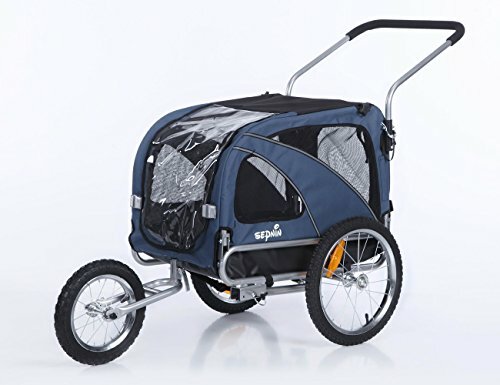 This small yet sturdy pet stroller from Sepnine features a dual entrance design for easy access to your pet. Its generous size can accommodate pets weighing up to 66 pounds. There is a safety leash inside to prevent your pet from jumping out and hurting himself while you’re walking him. The trailer will fold down in case you need to store it at the back of the car for traveling. It also has mesh cover on the front and rear access window to provide maximum airflow for your dog. This pet stroller is an ideal choice for pet parents who wanted to take their senior dogs on a walk without exerting much effort. 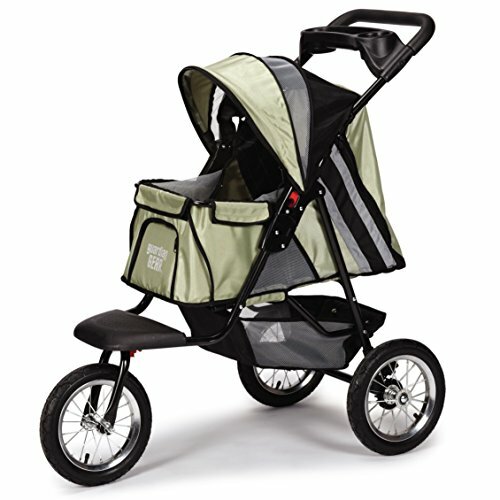 Another product from Pet Gear is this all-new easy-locking NO-zip entry pet stroller. It has a plush bolster pad for the comfort of your dog. Its extra-wide carriage provides a comfortable and spacious ride. It can even accommodate multiple small dogs at a time. The pet stroller features two 12-inch quick release air tires and quick-locking rear pump. The cover is made of 600 denier water-resistant material. This weatherproof cover can help in protecting your pets from the harsh sunlight or light rain. The one hand easy-fold mechanism and ergonomic handle are ideal for long walks with your dog.